After five prototypes, I’ve completed the first project for the expansion of “The Anarchist’s Design Book,” which should be out in 2018. I now have to make a SketchUp drawing of the stool, which will take longer than building the stool from wood. After busting out a lot of staked chairs and stools this year, I’m able to build this stool in 3-1/2 hours, which includes finishing time. 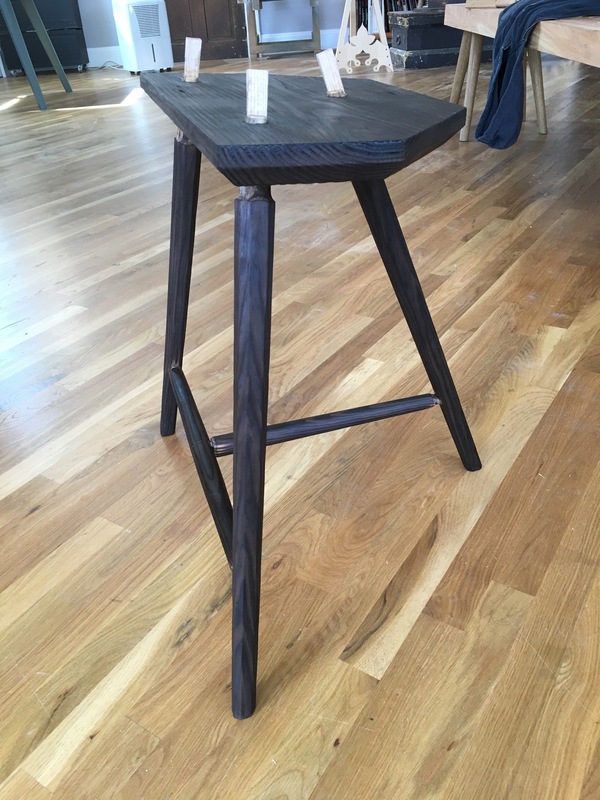 The finish on the stool – a combination of “uzukuri” and “shou sugi ban” techniques I’ve been experimenting with for more than two years – also allows me to add an appendix to the design book on these processes and the tools involved. I’m quite happy with this design. It’s simple, comfortable, inexpensive and easy. I have to take a break from the projects for the expansion of “The Anarchist’s Design Book” to build a commission and write an article for Popular Woodworking Magazine. When I complete those projects, I’ll return to making a staked armchair, a staked settee and two boarded projects for the book. The boarded projects include a nailed-together version of the Monticello bookcases I built in 2011 and a boarded English settee. This has long been on my list of projects to build. If you aren’t familiar with the form, check out this entry from TheFurnitureRecord.com. Please remove me from the list. I can’t unsubscribe via the unsubscribe button. Looks great Chris. What did you use to color the stool black. I really like the black and how you can still see the grain pattern. Really nice job, thanks for posting it. I scraped away the earlywood with rush. Then burnt the surfaces (not the joints) with a MAPP torch. I then used a stiff brush to remove any char and top-coated the stool with a linseed oil/beeswax mixture. What is “rush” in this context? Got it. You get this from the same guy who makes your polissoirs? Looking forward to hearing more about the process. Everyone else seems to be using wire brushes or sand blasting. I’m pretty sure he buried it in feces for half a year. It didn’t crack or break, so he made a stool out of it. Reminds me of your batonga stool samples. I apologize if you addressed this question already, but will these new projects be in a revised edition of the ADB, or comprise a second book? Here’s what will happen: The new chapters will be added to the existing book (and the price likely will go up a few dollars). Anyone who bought the book (no matter where) will be able to download those new chapters for free. So if you bought the book, you won’t be punished for being an early adopter. That’s awesome, taking care of existing owners of the first edition. Thanks LAP. Looking forward to these adds. I was skeptical in the first few prototypes, but I really like this version. I think thinning out the legs were what did it for me. Can you post a side profile pictures, interested to see the angle of the seat a bit more. Ah you torched it before assembly so as to not overheat the glue. Can’t wait to download the new chapters and freak out my neighbors with fire. Every time I look at the stool it seems as though the seat is pitched either toward the single leg or the pair, depending on the viewing angle. Is the seat level, or pitched to the front? It is pitched about 7° back. The front of the stool has two legs. The back has one leg. When I googled “udukuri” I got back some results but many of them involved crafty neon paint and resin projects (neat, but not what I was looking for). I had better luck finding examples of work I was interested in after stumbling on an alternative spelling and searching for “uzukuri”. Yup. That’s a typo. Sorry. Fixing it. Dang. I think you nailed it! Thanks! Once I figure out how texturing works on sketchfab I’ll be able to show the wedged tenons and maybe the charred finish. Yeah, I’ll see if I can get a STEP uploaded to sketchfab after I tweak a couple dimensions. I photographed his one at the Lie-Nielson exhibit with Jim Ferrell. Is this also one of your. Jim took me to your shop and he had to drag me out of it. Your shop coupled with my love of photography, and fine woodworking presented a plethora of ideas at my feet. Thanks. I photographed this, “Staked High Stool, “with Jim Ferrell at the Lie-Nielson Tool exhibit in March. Is it one of your? Jim took me to your shop which coupled with my love of photography, and fine woodworking presented a plethora of ideas at my feet. Thanks to you he had to drag me out and begrudgingly we were on our way. Do you still have pictures of that Melancolia square we torched…too much? Somewhere – I think. Lesson: First the torch; then assemble. That’s a settle rather than a settee – unless you’re planning on upholstering it.